This Glucerna Hunger Smart Shake, Creamy Strawberry is a meal or snack replacement to help manage blood sugar spikes and the resulting hunger it may cause. Specifically designed for people with diabetes, each one has 15g of protein to help manage hunger, as well as CARBSTEADY, a unique blend of slow-release carbohydrates that helps manage blood sugar. These gluten-free shakes are also an outstanding source of 25 essential vitamins and minerals, as well as protein, fiber and the right amount of carbs to help support your overall health and vitality. They are suitable for use by people who are lactose intolerant. 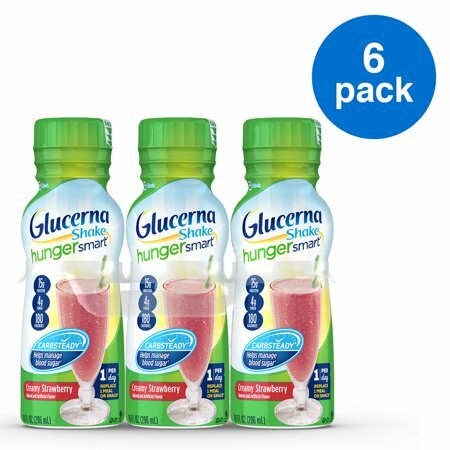 Each pack includes six 10 fl oz bottles of Glucerna Hunger Smart Shake, Creamy Strawberry. Ingredients: Water, Milk Protein Concentrate, Fructose, Corn Maltodextrin, High Oliec Safflower Oil; Less than 1% of: Soy Protein Isolate, Calcium Caseinate, Canola Oil, Soy Oil, Glycerin, Short-Chain Fructooligosaccharides, Sodium Citrate, Cellulose Gel, Natural and Artificial Flavors, Soy Fiber, Magnesium Phosphate, Soy Lecithin, Potassium Citrate, Ascorbic Acid, Potassium Chloride, Magnesium Chloride, Choline Chloride, Cellulose Gum, Carrageenan, Sucralose, Salt, Calcium Phosphate, Acesulfame Potassium, Ferrous Sulfate, Gellan Gum, dI-Alpha-Tocopheryl Acetate, Zinc Sulfate, Niacinamide, Calcium Pantothenate, Chromium Picolinate, Manganese Sulfate, Copper Sulfate, Vitamin A Palmitate, Pyridoxine Hydrochloride, Thiamine, Hydrochloride, Riboflavin, Folic Acid, Biotin, Vitamin D3, Sodium Molybdate, Potassium Iodide, Sodium Selenate, Phylloquinone, Vitamin B12. I absolutely love the Glucerna Hungersmart shakes. I find they make a great breakfast choice on days I'm to rushed to make a breakfast. They also come in handy when I get a snack attack! Love them! I have been using the Glucerna Smart Shake as an occasional meal replacement or mid-afternoon snack for about 2 months now. Very delicious product and it does the job intended; it satisfies my hunger until my next meal. Although I prefer the chocolate shake (hunger smart), this is a good alternative to break up the need of having to drink a shake almost every work day. I am type 2 diabetic. I often get busy with work and forget to eat my snack. I can drink one of these shakes in the morning and I don't have the extreme highs and lows throughout the day (normal healthy snack and lunch). Also, the 10 ounce shake is ok, but the 11.4 ounce was much better for an average 8 hour work day. "Hunger Smart" - yes, it is! Typically, I drink a hunger smart shake for breakfast, have a healthy snack, and lunch. When I get home in the afternoon, I'm not hungry to the point that I grab anything to eat (versus when I don't drink the shake). I jave my afternoon snack and can wait until my husband or I fix a healthy dinner. By controlling my hunger better, I have gotten my ACLs down from over 8 to 5.4 (told 5 is normal/non-diabetic) and lost some weight. Good luck my fellow diabetics, may your blood sugar always be in a heathly range.